A decorative ceramic key tasselÂ by London-based artist Camilla Bliss. It features a hand-carved guardian head in a blackÂ glaze, a horsehair tassel and a rope handle. It forms part of Camilla's 'Guardians of Bliss' collection. A decorative ceramic key tassel by London-based artist Camilla Bliss. It features a hand-carved guardian head in a black glaze, a horsehair tassel and a rope handle. It forms part of Camilla's 'Guardians of Bliss' collection. Using¬†a totemic face motif, Camilla's 'Guardians of Bliss' collection¬†explore the unusual juxtaposition of materials and textures within¬†decorative ceramics and accessories. Inspired by the ceremonies of life, death and memory Camilla's ceramics are hand carved with multiple Guardian reliefs, and coated in gold leaf or black and white glazes. The talismanic collection is based on a rumination on memory and the passing of time. The 'Guardians of Bliss' not only refers to Camilla's ancestral history, but also to a state of perfect happiness and wellbeing of life. 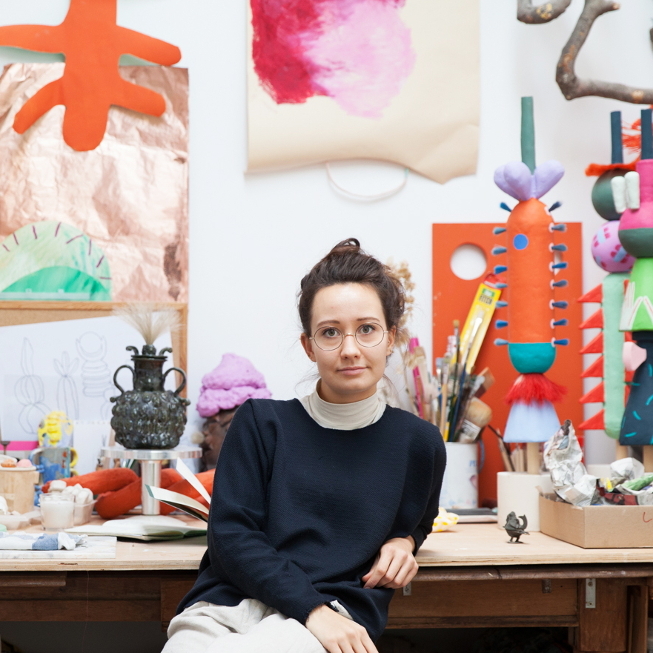 Camilla Bliss is a London-based contemporary designer and ceramicist who produces lighting, artworks and sculptures engaging her viewers with a dynamic energy and playfulness. Camilla draws inspiration from historical practices, social rituals and the parallels between the modern world and myths of the past. Her work is regularly exhibited across the UK, from her involvement in Chisenhale Studios ‘Into the Wild’ programme in 2014 to her recent residency with the Barbican Arts trust.